MLA citations done for you! ...by Begley Library databases. Learn more here. How do you format an MLA paper? Learn how here. Where librarians go when they have questions on MLA. 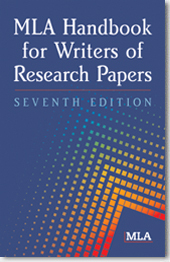 Information on general format of MLA research papers, in-text citations, endnotes/footnotes, and the works cited list from the Purdue Online Writing Lab at Purdue University. When you're done researching, you're also done with your works cited page!